This guitar plays and sounds as good as you could ever expect for less than a grand. We’re sold on the great playability and pleasing good looks, but it’s the tone that really knocks us bandy. This guitar feels alive in our hands. Like a vegan barbecue... there’s not a sausage. When was the last time you went shopping for a new acoustic guitar? The fact is, stamping any kind of brand identity into a new acoustic guitar isn’t easy. Most of the gear out there conforms to tried-and-trusted body formats, not least the iconic ‘dreadnought’. If you haven’t sussed it out already, that’s where the new PRS SE T50E model has a distinct advantage over the legions of doppelgängers. It is well, distinctive. By incorporating some well-kenned eye-candy from its electric solidbody stuff, it’s immediately obvious that this is a PRS guitar. The sweeping headstock shape is Exhibit A. The beautifully installed ‘bird’ fingerboard inlays are the smoking gun. This new Chinese-made model is a member of PRS’s affordable SE sub-brand. The Vintage Sunburst T50E features the PRS Tonare Grand body style. Further features include solid Sitka spruce top, three-piece 643mm (25.3-inch) scale mahogany neck, 300mm (11.8-inch) radius ebony fingerboards with 20 medium-sized frets, plus ebony bridge plate and bone top nuts and saddle. There’s also some nice abalone soundhole rosette detailing and shiny chrome tuners on the spec sheets. You get a proper deluxe hard case, too. Dig deeper and you find this character also comes brandishing a Fishman GT-1 preamp and under-saddle pickup. Yes, you’re looking at a well-sorted electro-acoustic here. The T50E plays host to PRS’s much-loved and fingered Wide Fat neck profile. At just under 43mm at the nut, this shape isn’t actually all that wide and it’s not quite as chubby as the name suggests, either. Judging by the satisfying amount of beef slapped into our palm we’ll chalk this shape up to a full C. A low action and sensibly spec’d 0.012 to 0.053 gauge strings help achieve a maximum score for the playability in both SEs. Being a newborn, this guitar will take a bit of encouragement before it reaches tonal adolescence. That said, the use of X/ Classical hybrid top bracing hasn’t half given it a great start in life. This setup offers the string tension resisting strength of traditional X-bracing, the format you’d find on, say, a dreadnought, with the flexibility of a classical guitar top. The more that top vibrates, the greater the tonal sweetness and output. It only bloody works. There’s a huge bottom-end twang in the T50E’s delivery. It’s that ‘piano-like’ thing that acoustic junkies are always going on about. The top-end is bright of course, yet there’s an underlying warmth that doubles up when you switch from a pick to the fleshy tips of your fingers. The obvious target of the PRS marketing for the T50E is the existing SE punter. You’ve gotta love that you can get the same neck profile on your solidbody and electro-acoustic guitars. That goes for lovers of US-made PRS gear, too. This model offers a high-enough spec and build quality to make it attractive to you well-heeled customers. The big success story here concerns that X/Classical hybrid top bracing. 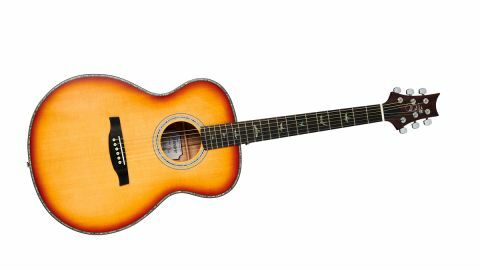 It can take a solid-spruce top some months of player-induced vibration to reveal its full vocal range. But here, by allowing its tops to vibrate as freely as possible, PRS has released some of that long-awaited maturity ahead of schedule. We still reckon these guys have got some growing up to do, but they sound tonally precocious straight from the factory. It’s tough to grumble about these things. This guitar plays and sounds as good as you could ever expect for less than a grand. Way better, in fact. It looks the absolute business as well.